The majority of overseas tourists that head to Sukhothai do so for one reason; the wonderful Sukhothai Historical Park. Filled with ancient temples dating back almost 800 years, the UNESCO World Heritage Site at Sukhothai is one of Thailand’s most famous tourist attractions set amidst beautiful countryside fringed with paddy-fields and mountains. The Historical Park is located in an area usually referred to as Old Sukhothai, a 15-minute songthaew ride away from the town of New Sukhothai. The main choice is whether to stay in Old or New Sukhothai. There are pros and cons to each location and it will ultimately boil down to individual personal preference. Basing yourself in Old Sukhothai places you closer to the Historical Park, but there is more choice of accommodation and places to eat and drink in New Sukhothai. If you do stay in New Sukhothai, shared songthaews to the Historical Park in Old Sukhothai cover the journey in 15 minutes with the one-way fare 30 Baht per person. The Kingdom of Sukhothai was established in 1238 with the area previously part of a Khmer empire. 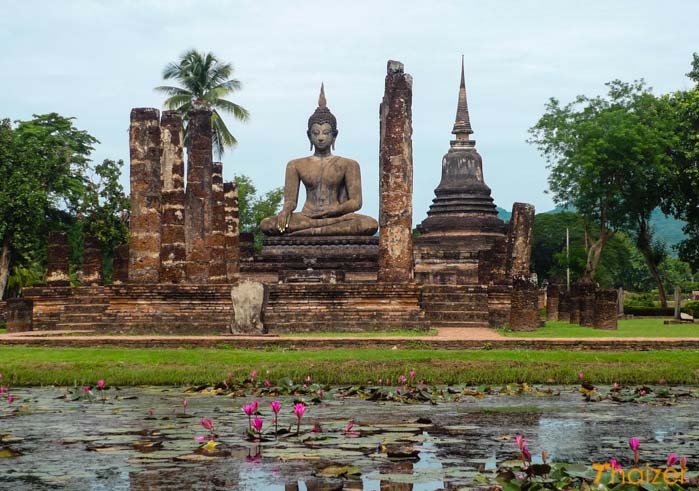 Sukhothai is sometimes referred to as the first Thai kingdom although historians will advise that isn’t strictly true with other Thai kingdoms including Lanna, Phayao and Chiang Saen having already been established before Sukhothai rose to prominence. What is undeniable is that the Sukhothai era was a golden one with the legacy living on in the language, art and religion of modern-day Thailand. King Ramkhamhaeng the Great (reign 1278-1298) is credited with developing the first Thai script and under his guidance Sukhothai expanded its borders to form an area larger than Thailand is today with parts of what is now Laos (including Luang Prabang and Vientiane) included in the Sukhothai kingdom. The death of King Ramkhamhaeng resulted in a rapid decline for Sukhothai with Ayutthaya to the south becoming the new power-house and by 1438 the Sukhothai kingdom was no more. Buses from Bangkok take approximately 6-7 hours departing from Bangkok’s northern bus terminal at Mo Chit. Buses from Chiang Mai’s Arcade bus station take approximately 5.5 hours. Trains from Bangkok or Chiang Mai go to Phitsanulok (listen for Thai people saying ‘Pee-Lok’ as an abbreviated version of the name) from where you need to transfer to a bus. The bus journey between Phitsanulok and Sukhothai takes an hour and departs at regular half-hourly intervals throughout the day.